Russell Nitrous system hose assemblies are constructed using Russell Power-Flex stainless steel braided hose. They feature a Teflon® inner liner and 308 stainless steel outer braid for the ultimate in strength, corrosion resistance and appearance. 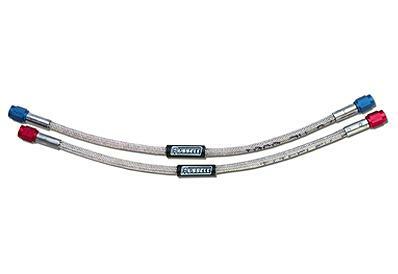 The Russell hose ends feature precision crimp installation using a hydraulic crimping method that provides a leak-free connection. All lines feature straight AN hose ends on both ends unless noted otherwise. Some hoses have 1/8” NPT male threads on one end to thread directly into solenoids with 1/8” NPT ports. Use lines with blue fittings for nitrous, and red fittings for fuel.